I about swooned when one of friends, Rita of Jewel School Friends, announced that she was going to host a blog hop featuring Chicklet Beads from Sue Beads. 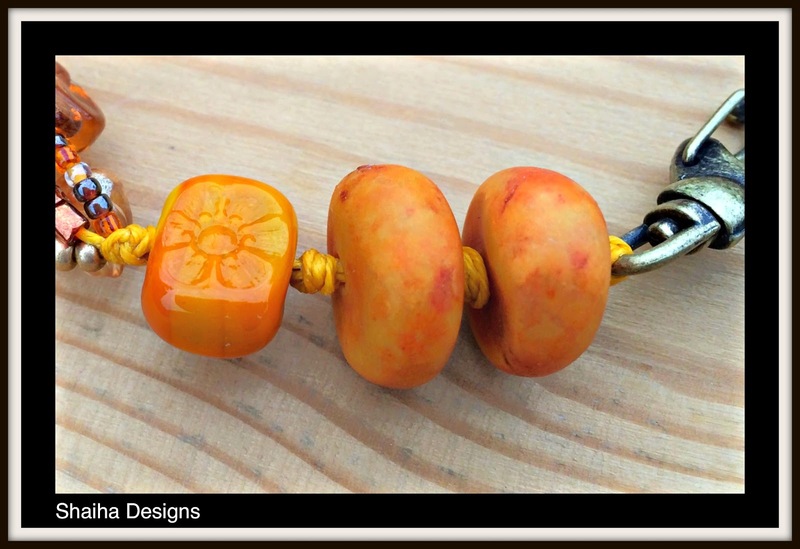 If you recall, I had the pleasure of working with these wonderful beads when I participated in a blog hop hosted by Art Jewelry Elements back in May. Just click here to check out the fun necklace I made then. 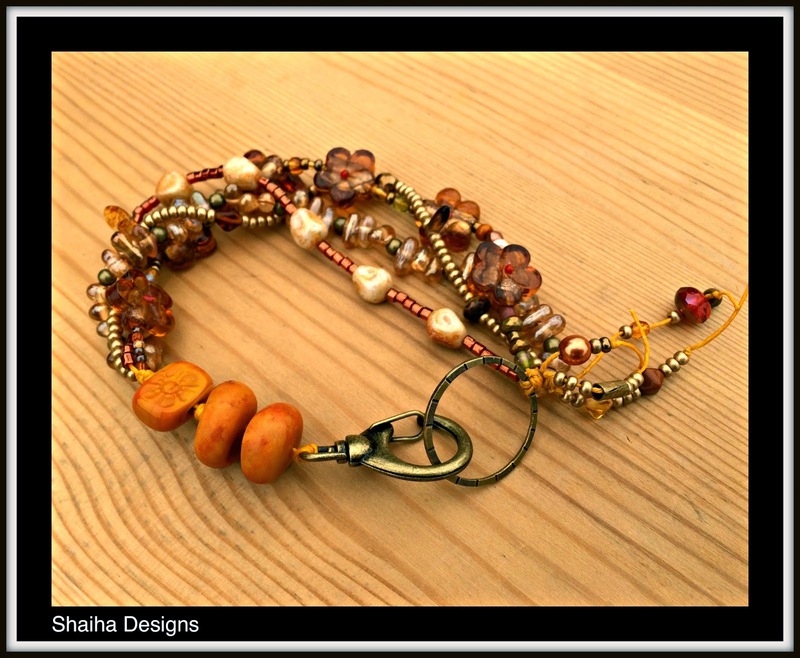 Anyways, I signed up just as soon as I saw the call for this blog hop because I wanted to get some more of these delightful beads and make a bracelet this time around. So I asked Sue to make me some up and let her choose the colors. And that is just what I did. But what came first was this necklace. I playing around with some patina and ended up with triangle with a deep sapphire/aqua color to it that I adored but it needed something more to really make it a stand out focal. And wouldn't you know, that I had a Chicklet of just the color ordered. It's almost like Sue had a crystal ball. I added in some crystal, brass and gorgeous apatite which I think is one of my new favorite stones. I knotted it all up on some Irish waxed linen. I have gotten a lot of nice compliments on this necklace and Rita is so right. Choosy chics do choose chicklets. Let's not forget the bracelet however. After all, that is why I joined this hop. This time around, I made the focal using one of Sue's chicklets and a couple of polymer beads made by Andrew Thorton. Don't they look like they were made for each other? I also added some Czech beads, crystal, ceramic and seed beads to the mix and knotted it all up on Irish waxed linen. The clasp is a fun one of aged brass. The colors are perfect for this coming autumn. I have worn this bracelet for a day and can attest to how comfortable it really is. If interested in purchasing just click here. Now speaking of great company... be sure to check out what everyone else has made with their chicklets. Love the necklace - and how the chicklet is front and center in your focal. But the bracelet...now that is an awesome design! And yes, Andrew's beads match perfectly to Sue's lampwork. Beautiful! Your bracelet is gorgeous. I love the colors and design! Such beautiful designs. I am in love with the electric blues in your necklace. Fabulous. 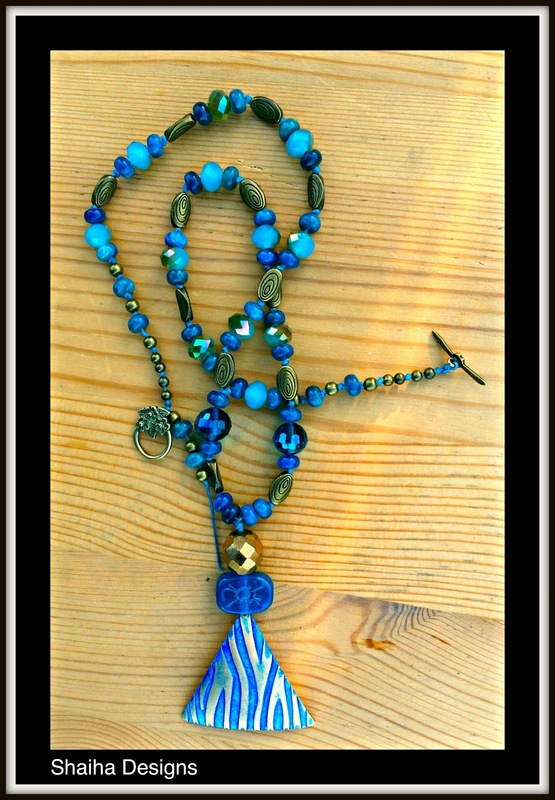 The necklace is gorgeous I love all the different shades of blue and the brass is a great supporter of the blue. The bracelet is beautiful and a perfect fall piece. Beautiful. Of course I love the bracelet. That necklace is really eye catching; the color pops and the geometric patterns in the beads and pendant draw you in. I love your pieces! The bracelet chicklet goes so well with Andrew's faux amber. Beautiful! Beautiful♥ creations 'around' such a little bead. I admire what you designed... Great, great pieces! Both of your designs are so stunning! I love that deep aqua necklace, and you did a great job with your triangular metal focal! Between the colors and your metal beads and focal, a very watery feeling emerges. It's wonderful! What pretty pieces - love what you did with both colors. Wow, both so different but equally gorgeous. The blue chicklet really does pop that beautiful focal, so so pretty! Now that bracelet is absolutely stunning, perfect design, just gorgeous! Your pieces are all so luscious! The blue necklace, though... awesome. I love blue!! Both lovely, but that bracelet is just divine. I love the design, and the colors are similar to what I chose as well. Great work! GREAT job! Such a cute bracelet and you're right - the beads DO look like they were made for each other! Beautiful pieces! I love the intensity of the blues in your necklace, but I must say that at heart I am an autumn girl and I would wear that bracelet all the time! So pretty! I love both your necklaces. The colour in the first one is stunning and the asymmetry in the second is perfect. I love that soft peach colour and you showcased it wonderfully. Love the necklace. 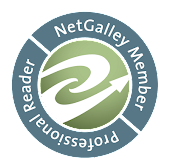 Your focal is awesome w/it's cool patina. That bracelet is so pretty - lovely colors and textures. Both your necklace and bracelet are stunning. Great use of design elements and colour. Sorry if this posts twice - my comments seem to be disappearing. I just love your pendant - great patina. The entire necklace is just super! And that bracelet - LOVE it! The various colors and textures really make it stunning. Great use of the 'chicklets' in both pieces! I love it! The colors of all the beads especially the polymer look like they were made for each other! Great job! 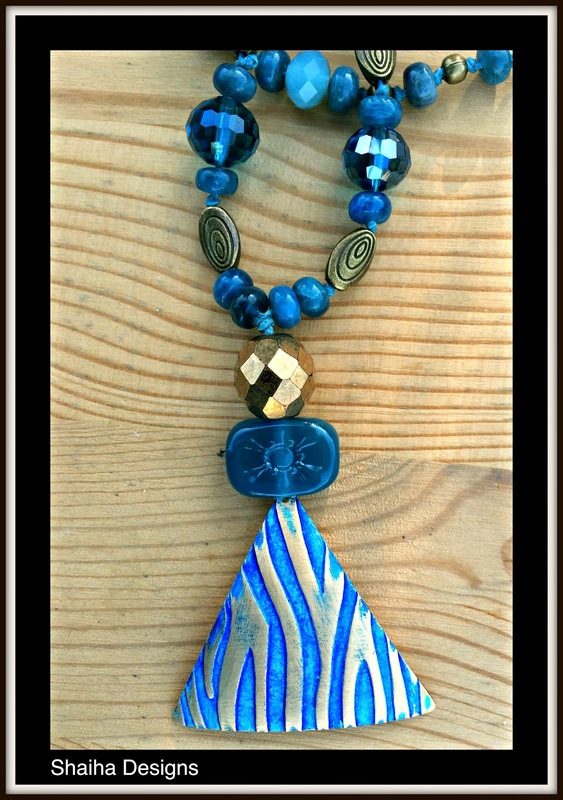 Love all the blues in the necklace!! I really like all the different shapes and colors in the bracelet. It will go with so many outfits. The blue necklace reminds me of the ocean(vacation :) ). I love both pieces, your designs are always so unique and pretty. Those pieces are beautiful. They can be worn on different occasions or at the same time.